When looking for an Audi dealership near Thousand Oaks look no further that Rusnak Westlake Audi for new, used and preowned audi cars and audi SUVs. Quality 2018, 2017, 2016, 2015, 2014, 2013 Audi A3, Audi A3 E Tron, Audi A4, Audi A4 Allroad, Audi A5, Audi A6, Audi A7, Audi A8, Audi S7, Audi RS 7, Audi RS 5, Audi RS 3, Audi R8 or the impressive Audi Q5, Audi Q3, Audi Q7, Audi TTS, Audi TT, Audi S3, Audi S4, Audi S5, audi S6, audi S8, Audi SQ5 for an Audi Price, Audi Cost, Audi Special and best selection.Rusnak/Westlake Audi dealership is located in Westlake Village just east of Thousand Oaks and west of Calabasas on the 101 hwy near Hwy 23 and 118 that is easy access for anyone in Los Angeles, Woodland Hills, Malibu, Glendale, Burbank, Ventura, Oxnard, Simi Valley, Moorpark to get to for lunch, after work or on the weekend. We have the perfect new Audi SUV, Audi Cars new or used waiting for you in our audi dealership near Thousand Oaks. 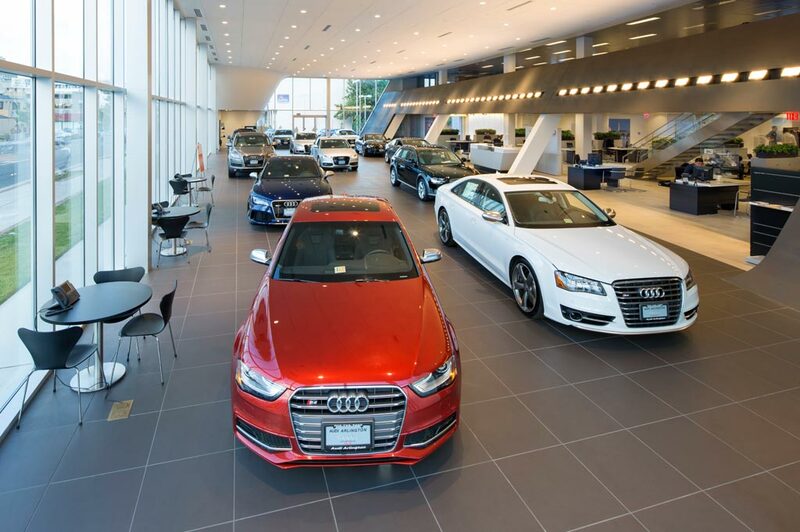 All our customers are guaranteed the Rusnak Standard and our commitment to provide a stellar quality customer service experience, we invite you to stop by our new audi dealership in Thousansd Oaks today. Whether you happen to be in the beginning stages of the car buying process, or if you've already picked out any audi model, color, and trim, our team will be standing by ready to assist! If you're in the market for a new car, you know to trust Audi. For that reason, Rusnak Westlake Audi dealer in Thousand Oaks keeps a wide range of new Audi cars models in stock, including the Q5, Q3, Q7, A4, A3, A5, A6, A8 and more! Our certified new and pre-owned Audi inventory means you can find the perfect audi model for the best audi car deal in Thousand Oaks. For new audi car deals, contact us today at 888-439-0078 to schedule a test drive, or visit our showroom at 3832 Thousand Oaks Boulevard Thousand Oaks, CA 91362. We're more than happy to set one up in the new audi suvs & new audi car models that interest you at your convenience. At our audi suvs dealership we proudly offer a wide selection of luxury pre-owned vehicles and many other used audi cars, ready to hit those Los Angeles streets. Not only do we carry a wide range of used audi cars & used suv models options, which include certified pre-owned Audi and other used Audi Suvs, as well as vehicles from other popular auto makers. Search our selection of used vehicles online, and be sure to reach out when you would like to set up a test drive, and see your top picks up close and in person. We are proud to be your Certified Pre-owned Audi dealer serving : Thousand Oaks, Los Angeles, Westlake Village, Malibu, Agoura Hills, Oak Park, Ventura, Newbury Park, Moorpark & Simi Valley, CA. The Rusnak/Westlake Audi dealership team isn't just committed to assisting drivers find their next new car, but we want to make sure that you drive home in it, too. That's why we staff an onsite Audi financing department that can help you make your dream of owning a new Audi, a reality. Simply put our Audi lease and loan experts are here to crunch the numbers and work their magic to help you get the right financing solution. Rusnak Westlake Audi dealer is also by your side whenever you need any Audi service work performed. Service specials for oil, engine, brakes, tires, batteries are common. Even if you haven't seen us before, we're proudly serving drivers in the Thousand Oaks area where we are premier Audi Dealership located on the 101 hwy between Thousand Oaks and Calabasas. What's more, our Audi auto parts team would be happy to get you whatever you need to keep your Audi vehicle on the road for many miles to come. Southern California Audi Cars Dealer Selling New Audi Cars and Used Audi Cars. Serving: Thousand Oaks, Los Angeles, Westlake Village, Malibu, Agoura Hills, Oak Park, Ventura, Newbury Park, Moorpark, and Simi Valley, CA. When looking for an Audi dealership near Thousand Oaks look no further that Rusnak Westlake Audi for new, used and preowned audi cars and audi SUVs. Quality 2018, 2017, 2016, 2015, 2014, 2013 Audi A3, Audi A3 E Tron, Audi A4, Audi A4 Allroad, Audi A5, Audi A6, Audi A7, Audi A8, Audi S7, Audi RS 7, Audi RS 5, Audi RS 3, Audi R8 or the impressive Audi Q5, Audi Q3, Audi Q7, Audi TTS, Audi TT, Audi S3, Audi S4, Audi S5, audi S6, audi S8, Audi SQ5 for an Audi Price, Audi Cost, Audi Special and best selection. Rusnak/Westlake Audi dealership is located in Westlake Village just east of Thousand Oaks and west of Calabasas on the 101 hwy near Hwy 23 and 118 that is easy access for anyone in Los Angeles, Woodland Hills, Malibu, Glendale, Burbank, Ventura, Oxnard, Simi Valley, Moorpark to get to for lunch, after work or on the weekend. We have the perfect new Audi SUV, Audi Cars new or used waiting for you in our audi dealership near Thousand Oaks. All our customers are guaranteed the Rusnak Standard and our commitment to provide a stellar quality customer service experience, we invite you to stop by our new audi dealership in Thousansd Oaks today. Whether you happen to be in the beginning stages of the car buying process, or if you've already picked out any audi model, color, and trim, our team will be standing by ready to assist! If you're in the market for a new car, you know to trust Audi. For that reason, Rusnak Westlake Audi dealer in Thousand Oaks keeps a wide range of new Audi cars models in stock, including the Q5, Q3, Q7, A4, A3, A5, A6, A8 and more! Our certified new and pre-owned Audi inventory means you can find the perfect audi model for the best audi car deal in Thousand Oaks. For new audi car deals, contact us today at 888-439-0078 to schedule a test drive, or visit our showroom at 3832 Thousand Oaks Boulevard Thousand Oaks,	CA	91362. We're more than happy to set one up in the new audi suvs & new audi car models that interest you at your convenience.